You can take a free drop from the path on the right of this hole. First determine the nearest point of relief. The nearest point of relief cannot be in a hazard or on a putting green (rule 24-2b), but it can be in bushes, trees or undergrowth. Note; the nearest point of relief is not necessarily the side of the hazard which is nearest to the ball. To determine where it is, select the club you are likely to hit next. Now take up a stance on one side of the hazard where your feet are clear of the hazard, this will differ for left and right handed players. Mark the spot where the ball would lie if you took up this stance. Do the same on the other side of the hazard. 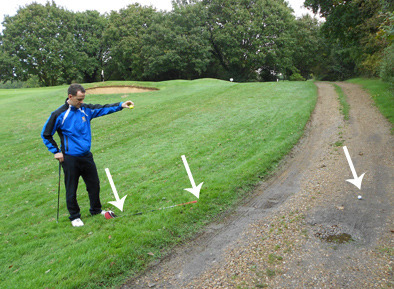 Identify which of these two markers is closest to where your ball lies. This is the nearest point of relief. You can now take a free drop from this spot. 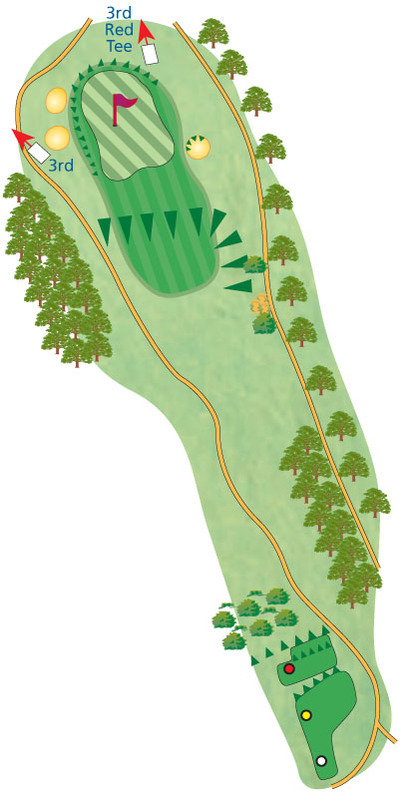 See Hole 1 for advice on how to take a free drop. One second arrow marking the nearest point of relief. A third arrow marking a spot one club length from that point. The player dropping his ball within one club length of the nearest point of relief.